Point to any of the artifacts or antiques in Seth Hunter’s store and he’ll tell you it has a story. “This isn’t your traditional antique shop,” said Hunter, sitting on a 1950s-era, red cushioned couch in a backwards green cap and a trendy black coat. He’s in his dimly lit new store, Toll Gate Revival, which opened on Lawrenceville’s Butler Street Oct. 15. Instead of the usual fare at antique stores, which might include vintage lace and lampshades, he has stocked his place with old tools, taxidermied animals and rough hewn furniture, some of which dates back to the 1940s. An old 48-star American flag form the 1950s sits folded up on one of the tables. On the other end of the store, a red waist-high Coca-Cola cooler sits in the middle of the wood paneled floor. The window displays are a collection of pulleys, wooden stools and a giant stuffed bear on its hind legs, beckoning passersby to enter through a rickety front-swinging door that thumps behind them as they walk in. Hunter, 29, made sure to play off of Pittsburgh’s industrial heritage while also collecting pieces that could be found in a ski cabin in the Laurel Mountains. The stripped concrete walls showcase an antlered caribou head while a dark brown shelf holds candles in tiny glass jars from 1820 House, an Ohio operation that sells similarly Rust Belt-themed decor and recycled products. Throughout the open floor space, various worn tools and machine parts sit on sanded tables while trendy outer wear from Penn Hills’ Seneca Creek company hang on racks and sit in cubbies. Above them, large porcelain signs depicting old logos from companies like Texaco and Shell Oil keep the store grounded in the past. He started Toll Gate, which is named after his family’s farm in Washington County, by traveling and setting up small antique shows along the East Coast. Last year, Hunter operated out of a storage unit in the North Side until he moved to Butler Street this fall. Hunter has a background in blue-collar, hands-on work, which he said influenced Toll Gate’s industrial theme. Before he got serious about antiquing, he worked in construction and was a manager at oil well sites, where he got experience repurposing the types of materials he now collects. Hunter relies predominantly on social media to market the store and its merchandise. His Instagram account is flooded with different angles of the store and close ups on some of the most provocative items, like the snarling stuffed bear. Since last year, he has amassed an Instagram following of over 6,500, most of whom, Hunter said, are millennials. One of his followers is Lisa Krowinski, 40, owner of neighboring Sapling Press, a letterpress card company. Krowinski found Hunter on Instagram before he moved in down the street. She now tracks her sales with a world map she bought from him when Toll Gate was still in the North Side. “[Hunter] does a great job with social media [and] tapping into young folks,” she said. While Toll Gate aims to perpetuate the Rust Belt aesthetic, Hunter also wants it to be Lawrenceville-specific. 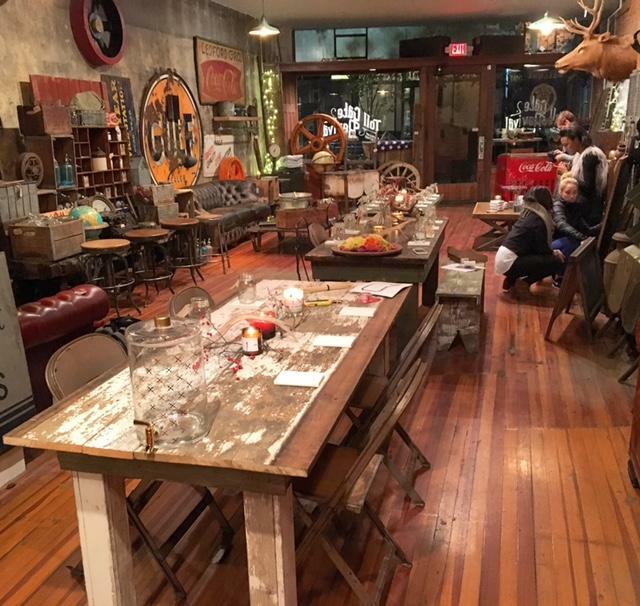 In addition to selling antiques, Hunter will also showcase local art and host community events like beer tastings. In the front right corner of the store stands an eight-foot-tall spray-painted Andrew Carnegie portrait on a corrugated sheet of metal that Hunter originally sold to local artist Jeremy Raymer. Cypher added that Lawrenceville, especially, welcomes Toll Gate’s gritty, blue-collar atmosphere. While Toll Gate will sell anything from an old bottle to the table holding it, Hunter is not ready to part with everything. One of the shop’s two couches, a faded-black one with splashes of aged yellow is part of Hunter’s personal collection. “[That] couch is the only thing not for sale,” he said, a reminder that Hunter remains a collector at heart, and Toll Gate is the place where he shares his passion for old things.